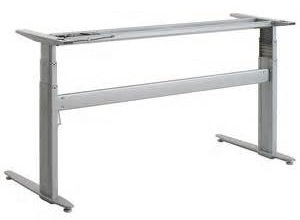 Description: Electric adjustable height table for sit/stand applications. Advantages: Fully adjustable desk height, monitor height and distance adjustment, and keyboard mouse height, distance, and tilt adjustment. Advantages: Price. 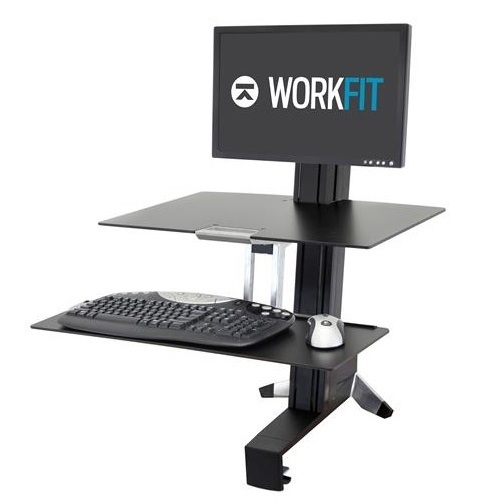 Attaching an existing desktop to an electric sit stand frame is a great cost effective option to achieve sit stand adjustability. 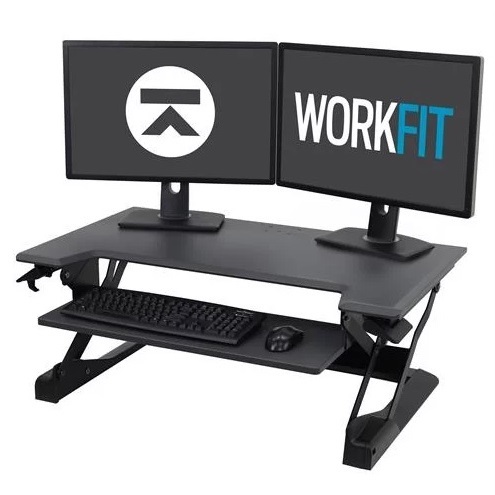 This easy-to-use sit-stand desk converter allows you to instantly raise or lower your keyboard and two displays in one simple motion, keeping your system stable as you work. Includes a complementary worksurface and larger keyboard tray. This easy-to-use sit-stand desk converter allows you to instantly raise or lower your keyboard and display in one simple motion, keeping your system stable as you work. Includes a complementary worksurface and larger keyboard tray. 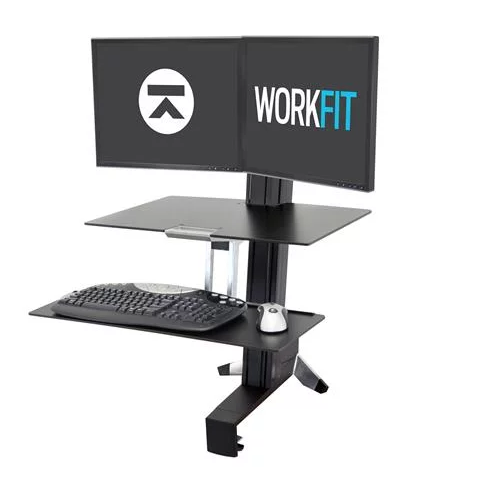 The enhanced WorkFit-TLE sit-stand desk offers a large, drop-down keyboard tray for improved ergonomics when sitting* and a convenient station for mobile devices. A cable management tray behind the monitor keeps cords organized and out of the way. 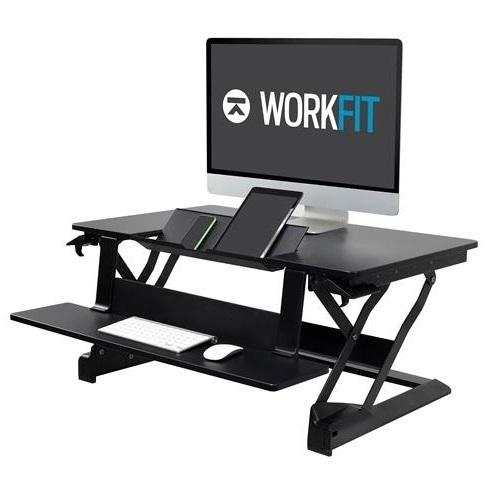 Like the WorkFit-TL, it maximizes work space as it moves straight up and down to quickly convert a tabletop into a healthy sit-stand workstation. 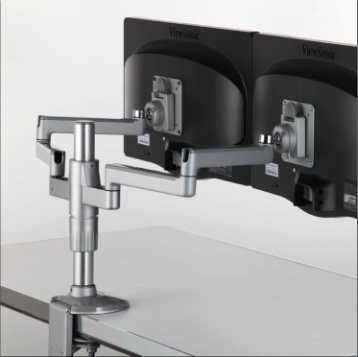 To improve the ergonomic vertical positioning between the monitor and keyboard tray, we recommend using a monitor riser accessory. Advantages: Has both Monitor and Keyboard height adjustment. Advantages: Keyboard drops below desk level for sitting. Monitor height is adjustable. 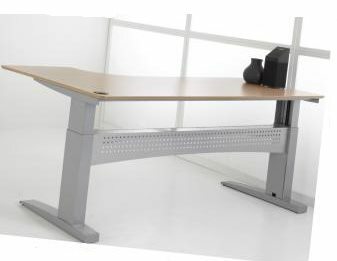 Will swing out of the way to allow for use of the desk surface when needed. A 2011 study published by the Centers for Disease Control and Prevention shows prolonged sitting is reduced when workers are equipped with sit-stand workstations. Among other things, increased standing among participants improved mood states and reduced incidents of neck and back pain. Modular sit stand options that attach to or sit on top of current desks offer a cost effective solution but do have varying degrees of advantages and disadvantages. Some have both Monitor and KBT adjustment. Some offer varying degrees of one or the other but not both. Stability, adjustability, and how they integrate/attach with the desk must also be considered. 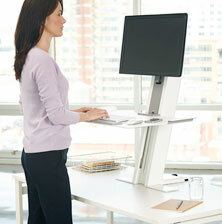 Front mounted or free standing sit stands minimize useable desk space. 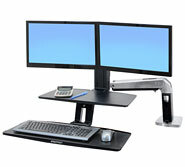 The Sit Stand Electric Desk with KBT and Monitor Arm provides the best overall solution.